HIM – AKA His Infernal Majesty, AKA your favorite Love Metal band – performed to a rapturous crowd at the Pageant in support of the band's seventh studio album, Screamworks: Love in Theory and Practice. I have to admit: I came into this show expecting the big guns – bright lights blasting from every direction while Ville Valo chain smoked at the mic and the rest of the band rocked out. Instead, what went down was a decidedly more low key treatment, with more moody sidelighting and backlighting, Ville without a mic stand, and not a cigarette in sight for the first three songs during which I photographed. Still, HIM was a great shoot, even if all the concert photographers did have to work a little harder to make images. 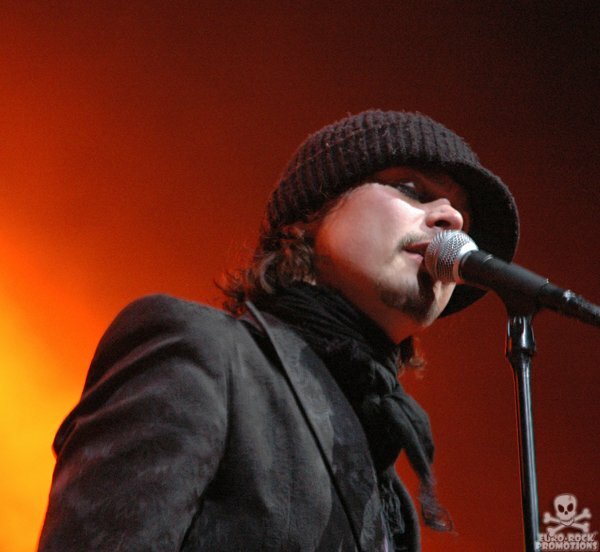 Lighting aside, I think Ville is a fascinating subject on stage, and this performance was no exception. Right behind Ville was guitarist Mikko Lindström, who, positioned very close to the LED arrays on the side of the stage, received some of the more interesting lighting of the night. Love the pics. Their low lighting as always been a challenge. But that’s what separates the pros from the amateurs. As one of their biggest fans I expected nothing less from you, Todd. Great job. As always. Thanks for the kind words. Their last tour stop at the Pageant was pretty bright in comparison, but I think this show was a good challenge. Glad to hear I’ve delivered for you – you fans are who I do it for. Really great shots Todd. Even if the lighting was a bit difficult for the photogs…it definitely made for some interesting pics. Absolutely love the lighting in number 8 and number 17 in the slideshow. Thanks for the comment, I appreciate it. It’s true, sometimes the trickiest lighting makes for the best shots. Yet again, great batch of photos. I’m curious.. I’m not sure if its different in the States, then it is in Canada. Do you go through the promoter of the concert or the band publicist? We have to go through the promoter, and at first, I was getting lots of love, but now not so much. Not sure what I’m doing wrong. Was hoping you might have some insight. Thanks for the comment. In the States, we almost always go through the band’s publicist for press credentials. The promoter is very rarely, if ever, the contact. I would try and build relationships with the major promoters in your area and work with them on their events so they can see the value in what you’re delivering. Fantastic, Todd! As always! I can’t tell you how much better with you stating, “even if all the concert photographers did have to work a little harder to make images.” It was nice to know it wasn’t just me. I knew you would be the one to be able to make it work! Thanks for the kind words. This wasn’t an easy show to photograph by any means – Ville was constantly moving, right on top of us, and under very little light. Certainly a change from the last show at the Pageant, where he was much more static at the mic and under brighter lights. These boys are near and dear to my heart. First band I ever shot and basically the ones I practiced on so I sort of owe where I’m at to them. Not only are they great to shoot and super musicians but they are fantastic guys as well. I’m shooting them in Dallas and Houston, myself. Todd when I heard you’d shot them I couldn’t wait for your pictures because I knew they’d be awesome and they are! As always amazing job, especially with the lighting conditions. Oh and since you mentioned the lack of cigarettes – Ville stopped smoking in February, finally. So no more haze of smoke! Thanks for the kind words, luck at the Texas shows! And that’s nice to hear Ville quit smoking, too – even if it did make for great photographs. Cheers. I love that Ville is moving around again. He’s been stuck in his little box by the mic stand for the past few years lol. No smoking or drinking for him now so he’s looking better than ever. Can I ask what lenses you used? I’m looking at getting a new one before the Dallas show. I was mostly shooting with the 50mm f/1.4, 85/1.4, and 24-70mm f/2.8. The 70-200mm wasn’t quite as useful due to the angle (high stage) and the quick movement, I felt. I think the best lenses for this tour will depend on the venue – overall, the primes really were nice to have for this show, but a midrange like the 24-70mm would be great, too. I usually do pretty good with my 50mm f/1.8 at this venue and if the lighting is right my 55-200mm f/2.8. Though if they stay with the dark lighting that one won’t work. Looking for a wider angle lens – 20mm maybe. Dunno if I can do it in time though. But thanks for letting me know what you used. I know some of the other shows have had a bit better lighting so maybe I’ll get lucky. I really didn’t go too wide at this show, due to the stage setup. I think your 50mm should do pretty well, but something more on a 35mm focal length might do well if you’re shooting on a 1.5x crop body. Good luck! I know we don’t talk much in the pit but I have to agree the lighting was less dramatic than I expected. While the performance was great, the lighting was a bit dissapointing. I remember when they came back in 2006, they had chandeliers and beautiful colors; lots of ambience, so shooting this show made it less than ideal. However, maybe it’s a bit unfair to say that. Since I shot Muse in Chicago last month (http://bit.ly/cUMaJO if you want to check out the photos), which the lighting production and performance were impeccable, everything since then has seemed, well, sub par. I hate to say it, really. Even in apple aperture I was only able to get about 20 decent shots from HIM out of 300 that I took in those 3 short songs. I had my aperture wide open at 2.8 and f/125, and ISO 1600. I’m curious, what settings did you use for this show? Good shots and the skin tones look great for such heavy use of back lighting! The lighting was underwhelming compared to the previous show at the Pageant. I was shooting at ISO 3200 with primes for a good deal of HIM’s set. I only uploaded 25 images from HIM, and I’m OK with that number. Sometimes more is only more. Aah…looks like I’m going to have to save up for the 1D Mark III or 1Ds as I’ve outgrown my midgrade 450D that struggles at ISO 1600 with noise! I would switch to Nikon if I didn’t already have 3 canon lenses, and I can see the 3200 definitely did well. You’re right, sometimes less is more when it comes to choosing shots. It’s nice to get at least 20-25 great shots. Ville seemed pretty much in the “zone” and didn’t really seem to make much eye contact with anyone – band or crowd, let alone photogs. He mostly had his eyes closed, and even pulled his cap down over his eyes (at seen in the lead image). I would have loved to see some white lighting for this show, but alas, it wasn’t to be. Thanks for the comment! Hey Todd, awesome photos, great job! Especially because of the lightning. We (the fans) always try to get some good shots of them but of course it’s nothing compared to the work of a PRO ;) I’m glad that you liked the show,HIM is a great live band and they really don’t need that many effects to give a memorable performance, and Ville and Linde really are a good posers hehe! Keep up the good work! Thanks for the kind comment. Ever since I heard HIM was coming back, I’ve been looking forward to this show. Ville and Linde are great subjects, that’s for sure. Mikko was making some most excellent guitar faces, he was lot of fun to photograph at this concert. Thanks again. When you email the publicist do you say you are shooting for iss.com? Thanks for sharing your beautiful pictures. I was towards the back, but I had a good view of the show as just a regular fan. I have a fairly nice camera and I had a heck of a time getting a decent shot with the lighting, so its nice to hear that even professional photographers had to work at it. Wow! These are such wonderful shots! I’ve been looking for photos of that concert. I was on the floor, close enough to zoom in near Ville Valo and Mikko Lindstrom. My camera took two good pics of the stage (trying to test) before it died right before the band came on!!! I had a good spot too! *sob* I was soooo sad! I tried taking pics on my camera phone, but they came out terrible. Thank you for sharing!!! !